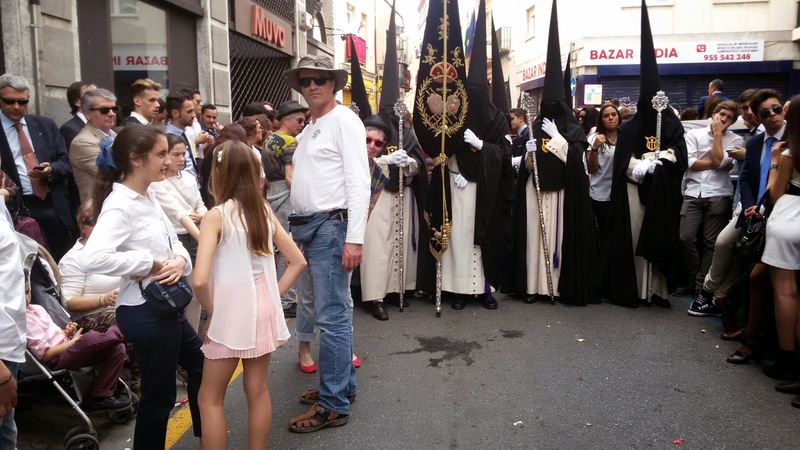 At 6:30 a.m.,we headed for Seville in an overfilled station wagon. It was about 14º C when we hit the road and even cooler in the foggy plains of Alentejo. 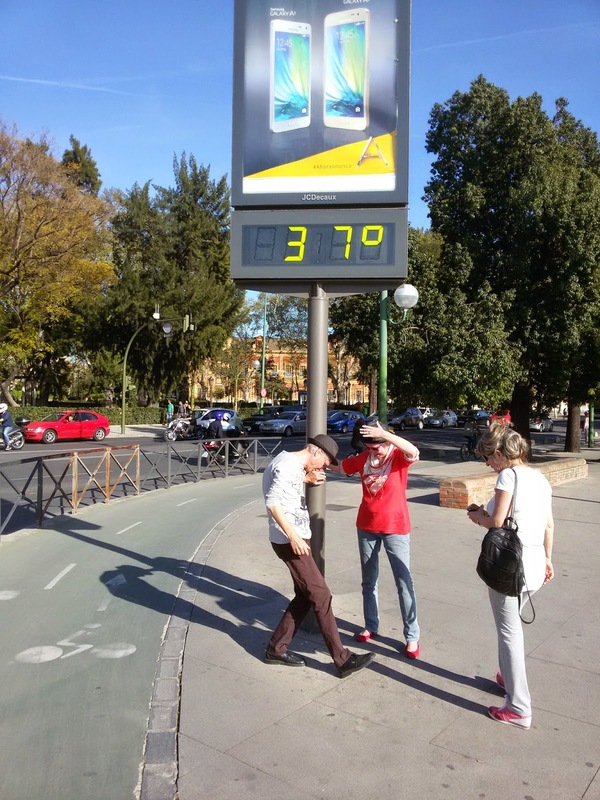 By the time we reached Seville, checked into our apartment and walked downtown it was hot. Hot! At the end of March. I think the thermometer was exaggerating, it only felt like 32º. Heat doesn't bother me much - I simply sweat it out. To think of it, I have a high tolerance to most things except annoying persons, and even then I try to make the best of the situation until I can escape. 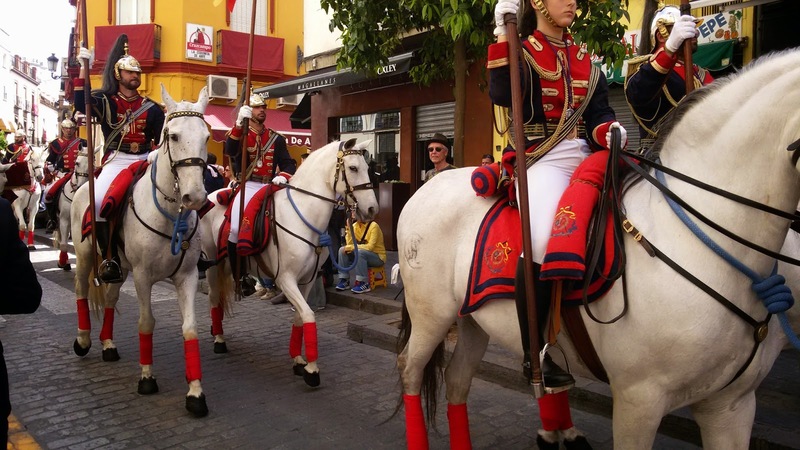 I visited Seville a long, long time ago when I passed through on my way to Morocco. My memory still held images of narrow streets and buildings like the one above. It looked almost the same as I remembered except for the night life. Back then we did the nightlife, this time we went to bed early with sore feet. Back then we stayed in a room in the old quarter and hit the bars looking for tourist girls (yeah, I was young, real young). My friend Dan, who was engaged to be married promised he was only going to look at the girls. And he stuck to his promise, which was a waste because he broke up with his fiancée soon after returning to Canada. 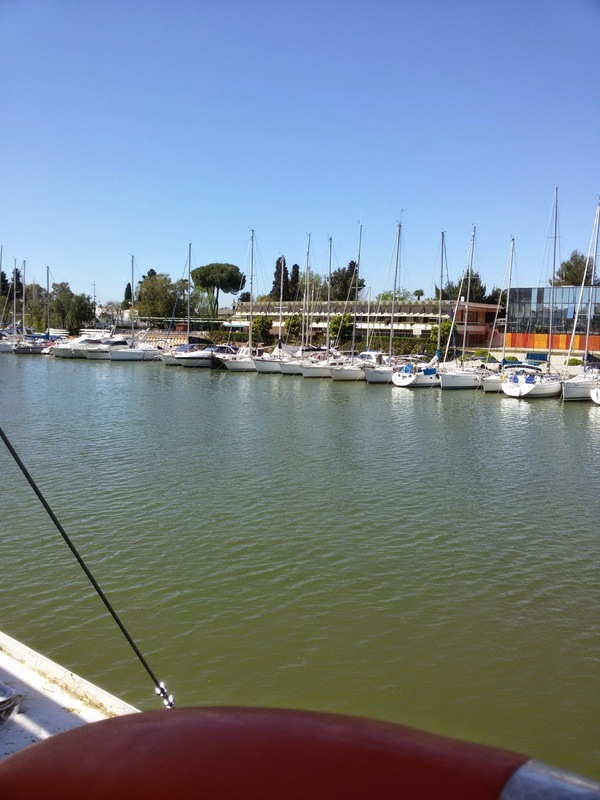 This is the Seville marina on the river. No pontoon fingers. A marina without fingers is a glorified mooring ball field. Maybe it's a subtle way of encouraging old sailors to retire. We went on an absurd one-hour boat trip along the river. I bargained with the ticket seller and we got 4 tickets for the price of 3 (€45). A total rip-off because the ferry moved at a snail's speed downriver past the marina, turned around very, very slowly and then doubled back. It then crawled 500 meters upstream past its starting point, turned around very, very, very slowly and returned to its starting point. That's it. That's what a whole fleet of tourist boats did. You could see the same sights standing on the dock. Ana caught me taking a selfie with a horse. 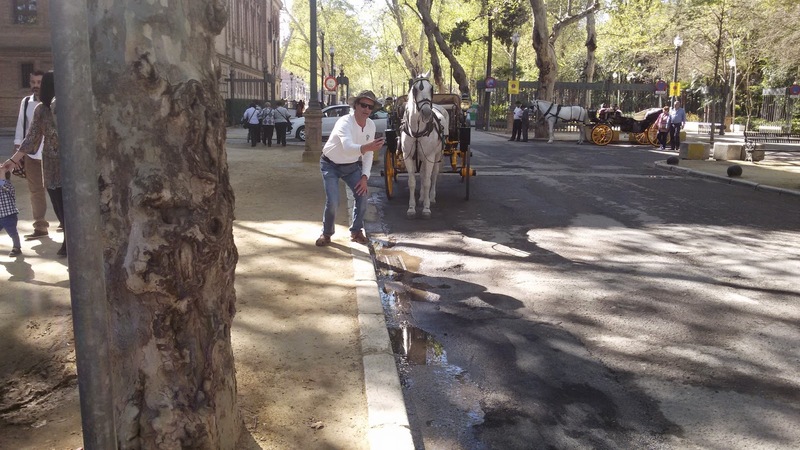 There are tourist horse carriage rides everywhere, but no horse crap because they use a canvas toilet under the horse's tail. 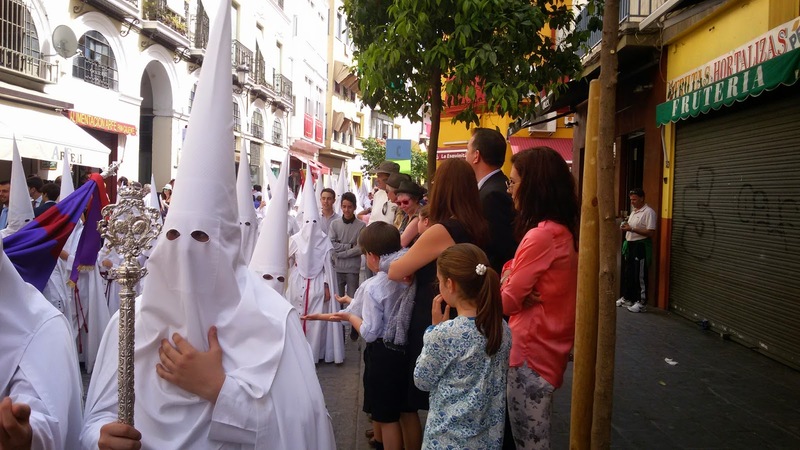 The next day we witnessed the "Dia del Ramos" Easter festivities that got going around lunch time. Everybody, young and old, were into it and the place was buzzing. We hung out for a while until the crowds began to build at an alarming rate and we got thirsty and foot-tired. ...toward these guys. Didn't stick around to see what it was all about. 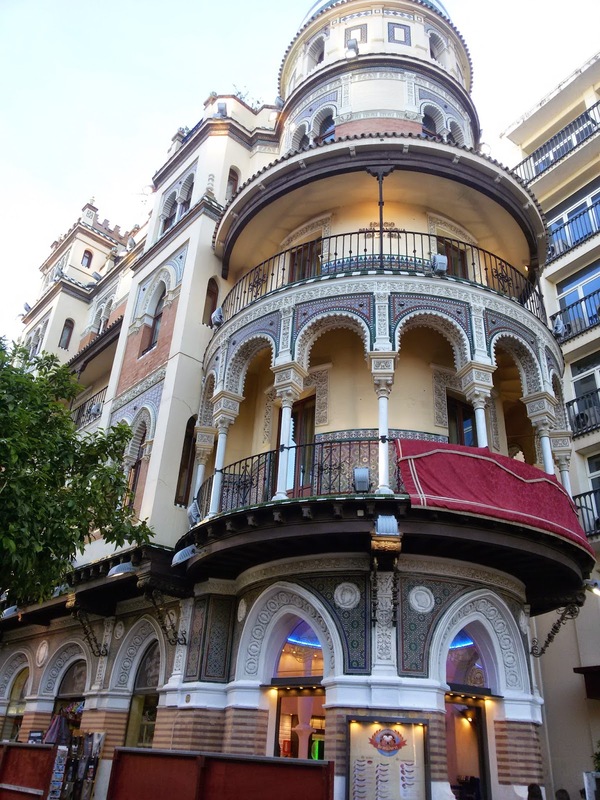 Anyway, the streets were packed with people flowing into the old city center, and we literally pushed our way out of there and finally found an outdoor café with an empty table. Nice! And no boat to worry about getting bumped or dragging. To sum it up... I miss being a tourist! Being a tourist is alright - way better than slaving - but in the end I'd rather be a ragged sailor dinghying into town for groceries and a cold beer. But being a tourist is a hell of a lot better than my anchor fiasco last year in Sesimbra.